© Copyright 2008-2019 Steven J. Korbel. All Rights Reserved. TRUE, TRADITIONAL TRAVEL BASEBALL PROGRAM! Native Americans use symbols & designs to represent specific ideas or cultural expressions. The bear is a powerful guardian; physical strength & leadership! The bear symbolizes sweetness of life and introspection. The bear claw was used to summon the power of the animal. The bear tracks can signify strength and well being, leadership and authority. Please click refresh/reload on your browser for our latest updated content! BEING RESCHEDULED DUE TO INSTRUCTOR! Note: Robert Pillman is doing the certification. Good for two years with American Heart Association. $45 cash or check payable to Robert Pillman. All coaches and adults assisting kids must be N.Y.S.C.A., $20 1-year or multi-year discounts with many perks! Copy of your MBR card required. Click 'Get Started' at the link above. Note, in Step 3, type in 'Character Nation' and choose "Character Nation (Lincoln Way Prospects) are the organization. This is a very easy process. You must link to Character Nation or you will not show up in my report. I recommend that you get the $35 two-year membership. Note: This is also a NAYS Select Coach Advanced Training option with huge Membership Benefits. New for 2019, Prospects Baseball will reimburse any coach $10 of your first year if you choose to be a NAYS Select Coach! Link to Select Coach Clinic here and follow same instructions. Congratulations to Kyle Labedz, Prospects Xposure 17/18U Red, Class of 2019! Kyle has committed to The Milwaukee School of Engineering. He took advantage of years of Prospects Xposure training and tournament play. and to the entire Labedz family and Coach Husted from 2019 18U Red. Congratulations to Justin Gasper, Prospects Xposure 17/18U Red, Class of 2019! Justin has committed to Dominican University. and to the entire Gasper family and Coach Husted from 2019 18U Red. Congratulations to Noah Cantleberry, Prospects Xposure 17/18U Red, Class of 2019! Noah has committed to Olney Central College. and to the entire Cantleberry family and Coach Husted from 2019 18U Red. Congratulations to Diego Blanco, Prospects Xposure 17/18U Red, Class of 2019! Diego has committed to Roosevelt University. and to the entire Blanco family and Coach Husted from 2019 18U Red. Congratulations to Logan Meyer, Prospects Xposure alumn 17U Navy, Class of 2019! Logan has committed to University of Tampa (NCAA D-2). and to the entire Meyer family and Coach Cech from 2018 17U Navy. Congratulations to Tim Rybarczyk (RHP), Prospects Xposure 17/18U Red, Class of 2019! Tim has committed to Triton College (NJCAA D-1), 3X defending N4C conference champions. and to the entire Rybarczyk family and Coach Husted, manager of the 17/18U Xposure Red squad. Congratulations to Mike Campo, Prospects Xposure 17/18U Red, Class of 2019! Mike has committed to Purdue University Northwest (NCAA D-2). and to the entire Campo family and Coach Husted, manager of the 17/18U Xposure Red squad. Congratulations to Nolan & John Weis, Prospects Xposure 18U Red, Class of 2019! Nolan & John are talented multi-sport athletes and have committed to University of St. Francis. They're going to enjoy summer tourney play with Xposure and then golf in college. Congratulations to their parents, Andy and Donna, and to the entire Weis family. LIMITED SPOTS - REQUEST TRYOUT ASAP! 13U Orange vs. 13U Amer. Teams will use our Team Snap to assign uniforms for each game. Please refer to Team Snap. © Copyright 2008-2019 Lincoln-Way Prospects Travel Baseball™ and Steven J. Korbel. All Rights Reserved. 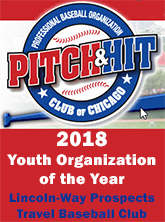 Prospects Baseball™ is an Illinois (Reg. #111238) and Indiana registered service mark of Steven J. Korbel. Lincoln-Way Prospects Travel Baseball™ has an expressed written agreement to use said service marks in 2008-2019.